Khubaib Bilal stands in the middle of what was once a home. He’s surrounded by rubble, piles of shattered bricks and broken remnants of a family’s belongings. He scans the remote valley around him and where the broken roads disappear into the mountains. The wind picks up suddenly, sharp and cold, signaling that winter is almost here. It’s been almost a month since the 7.5 earthquake first struck, severely affecting communities in Afghanistan and Pakistan. Over 300 lives were lost in Pakistan, although no official death count has been released yet. The most affected are those that live in the remote villages of Pakistan where humanitarian aid is harder to reach. Pakistan still needs our help. As the winter season approaches, there is a great need for aid such as winter kits. Many of the victims are struggling to rebuild their homes or keep warm in the face of the oncoming colder weather. Bilal works as a manager for Alkhidmat Foundation of Pakistan (AKFP). 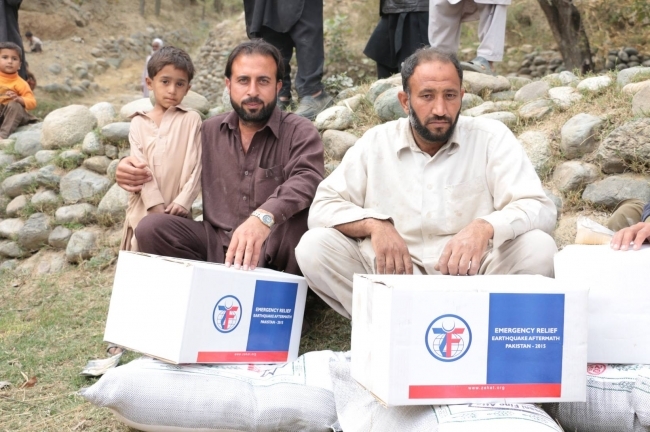 Alkhidmat is partnered with Zakat Foundation of America (ZF) and has been on the ground distributing relief ever since the earthquake occurred. ZF and AKFP have worked together to deliver aid in the form of blankets, tents, and food items. ZF is still active in distributing emergency relief in Pakistan and hopes to continue this campaign with the support of our donors. Imagine providing a warm coat or blanket to a homeless family living near the mountain ranges of Pakistan. The sense of relief would be priceless. Click here to donate towards the earthquake emergency relief or any other active campaign.